In his latter decades he was one of America's finest over-actors, but long ago Ernest Borgnine was the real deal. He was Fatso in From Here to Eternity (1953), got beaten up by Spencer Tracy in Bad Day at Black Rock, and won his Oscar for playing the sensitive butcher in Marty (1955). 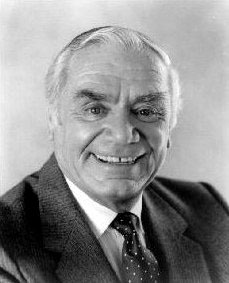 Borgnine is best known as Lt. Cdr. Quinton McHale on TV's McHale's Navy and two 1960s movies spawned from the sitcom (McHale's Navy and McHale's Navy Joins the Air Force). He was also the voice of "Mermaid Man" on TV's SpongeBob SquarePants, "Carface" in All Dogs Go to Heaven II, and the "center square" on Hollywood Squares when the game show first debuted in 1966. Hollywood Walk of Fame 6324 Hollywood Blvd.